Beginning in the 1880s, coastal dunes in the United States were planted with European beachgrass (Ammophila arenaria) in an attempt to hold the sand in place and prevent it from migrating. The grass did the job it was brought in to do. As it trapped sand in its deep roots, the dunes at the beachfront grew higher and steeper and less sand moved inland. But, like many attempts to control nature, this one had unintended consequences. 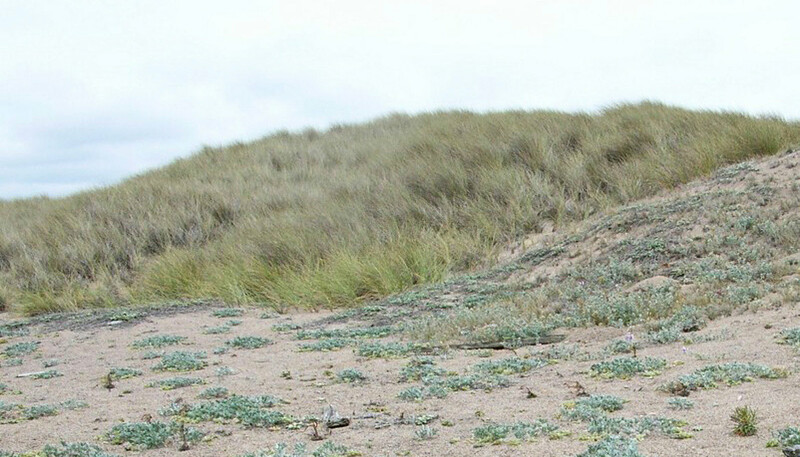 Although dunes may look barren, they are actually reservoirs of biodiversity. “If you’re a plant lover, the sand dunes are just spectacular,” says Eleanor Pardini, assistant director of environmental studies at Washington University in St. Louis. Many plants and animals are adapted to living in the patchwork of open and stabilized microhabitats that characterized dunes subject to frequent wind disturbance, she says. In PLOS ONE, Pardini and her colleagues Kyle Vickstrom, then a Washington University undergraduate, and Tiffany Knight, associate professor of biology, published a demographic study of two endangered plants, Tidestrom’s lupine (Lupinus tidestromii), and beach layia (Layia carnosa), at Point Reyes National Seashore north of San Francisco. Their work shows that these two species favor open sand and that the germination rate for lupine is far higher in recently disturbed open areas than in areas that already have plant cover. “It was exciting to put some numbers on the plants’ need for disturbed habitat,” Pardini says. One reason is that the numbers strengthen the case for restoring the historical disturbance regime by removing the beachgrass and allowing the sand to move. “Our results suggest that large-scale restorations may be necessary to allow native plant species to persist,” she says. Plants are not the only dune species adapted to wind disturbance, she points out. Many rare species have evolved to take advantage of transient disturbances to their environment. 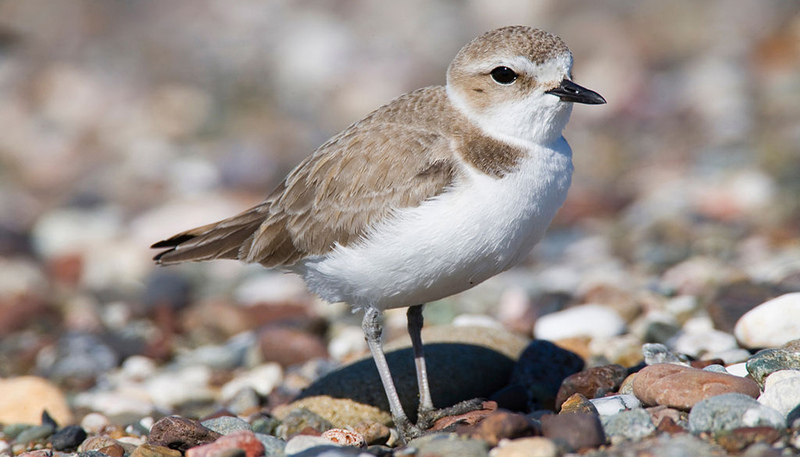 For example, the Western snowy plover (Charadrius nivosus nivosus), another endangered dune species found at Point Reyes, selects sites with open sand for courtship and nesting. 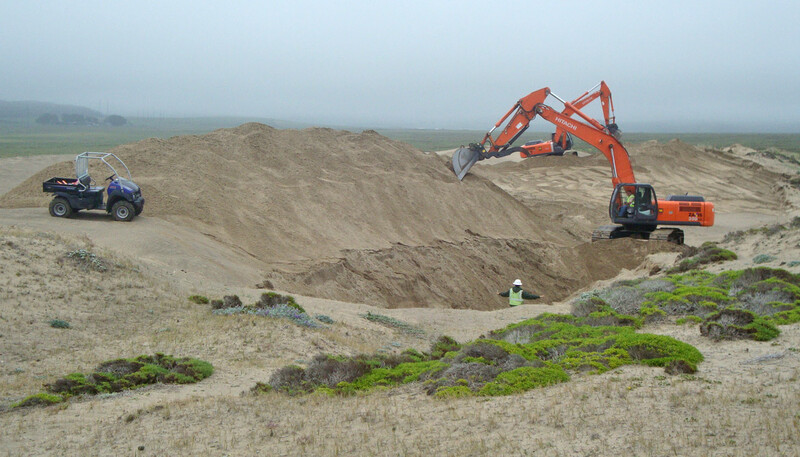 Rescuing native species is not the only reason to restore the dunes, however. Beachgrass alters the topography of the dunes in ways that make them more vulnerable to erosion, Pardini says. “Native grasses are not as dense as beachgrass, so they allow some sand movement. The dune is a little bit mobile in its response to storm surges and strong tides. “Beachgrass, on the other hand, creates tall, steep foredunes, with sand locked so tightly that the dunes are not able to withstand pummeling. Instead of absorbing strong wave action overwash, whole chunks of plant-bound dune just break off and fall into the ocean. You can see the edge of plant-bound dune creep inward, closer and closer to valuable farm land or standing structures,” Pardini says. The dunes at Point Reyes house incredible species diversity, she says. And many of the native plants have made intriguing adaptations to the trials of life in the sand. For example, Tidestrom’s lupine has hairy leaves that trap a thin layer of water-saturated air next to the leaf to slow down transpiration, she said. Lupines, like other early successional plants, are also able to survive sand burial. “If you dig out the sand around little lupine leaves sticking out of a patch of blown sand, you sometimes find the leaves are attached to one of many branches that all go back to a much older plant,” Pardini says. Tidestrom’s lupine seeds also have hard seed coats, which helps them stay viable even if they spend a long time buried in the sand. “In fact, the seed coat needs to be ‘scarified’ by tumbling in the sand if the seed is to germinate,” Pardini says. Pardini’s coauthor Tiffany Knight is an expert in a modeling technique called population viability analysis that can be used to project potential trajectories of an endangered population of plants or animals under different management schemes, given some assumptions about birth and death. Each run of the model is essentially an if-then experiment: if a management action alters birth or death rates in a particular way, would the population thrive and increase or dwindle and die away? 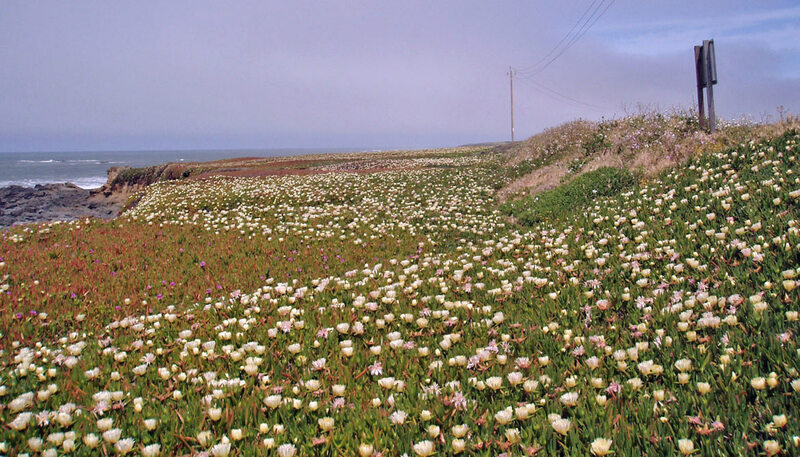 For the study, the scientists surveyed vegetation in 145 randomly chosen meter-square plots in the dunes near Abbott’s Lagoon, an area in Point Reyes that hosts the largest remaining population of Tidestrom’s lupine. “We recorded the presence or absence of beach layia and Tidestrom’s lupine, and in the case of Tidestrom’s lupine, which is a perennial, the plant’s lifestage. Analysis of this data showed that both rare plants occur more frequently in open sand than would be expected by chance, and that seedlings of Tidestrom’s lupine particularly favored open patches. “Our model shows that the population growth rate of Tidestom’s lupine is higher in early habitats than late habitats, primarily because seedling germination is higher there,” Pardini says. The scientists hope their accumulating data on Tidestrom’s lupine and other endangered plants will be used to answer a broad set of management questions, one of the most important of which is how best to restore the native dune system, with its ability to bend, rather than break, before the wind. “As climate change leads to more frequent storms, intense tides and extreme storm surges, it’s really important to have the intact native dune in coastal areas,” Pardini says.